I at least hope National Park Service listens. Anywho... National Park Service had a public comment period for the DRAFT ENVIRONMENTAL ASSESSMENT - ANACOSTIA RIVERWALK TRAIL SECTION 3. Ms V actually forgot about it, but I was able to quickly skim the EA and whip up some comments. My two cents. I am a resident of Fairfax Village in the Hillcrest neighborhood and I'm commute via bike on a regular basis. I support ALTERNATIVE B: REALIGNMENT OF SECTION 3 OF THE ANACOSTIA RIVERWALK TRAIL (NPS PREFERRED). This alternative would provide much needed connections along the Anacostia River. It would be a safer north to south route for cyclists than along the local roads. Many of the designated bike routes in Ward 7 are not intuitive or obvious if someone isn't a regular user. Please ensure adequate signage and other visual clues to guide cyclist safely through the area. Safety is a concern for many cyclist. Given some of the safety challenges along the Met-Branch Trail, please ensure that a safety plan is developed, funded, and implemented as part of this project. This includes, but not limited to, adequate lighting, emergency call boxes, security cameras, snow/ice removal, and US Park Police bike patrol. Final design should incorporate art that celebrates and reflects the history of the river. As mentioned in the background, accessing the river is a challenge. Please include paths that connect the local community to this trail. Councilmember Cheh received over 4,000 responses on her survey about taxis in DC. Mike Debonis at Washington Post has a great summary of the survey. Those last two complaints — driver “profiling” and refusing to haul passengers to where they want to go — have long been leveled against city cab drivers, and they were leveled often by the survey respondents. They also both happen to be illegal under the current taxi regulations. Dear Ward 7 residents, please let Ms Cheh know your experiences with taxis in this city. She is holding a hearing on January 30, 2012, 11:00 AM in room 412 of the John A. Wilson Building (1350 Pennsylvania Ave NW). Please sign up to testify in person or submit written testimony for the record. Ms. V posted the hearing notice and bills below so you don't have to go searching for them. On January 30, 2012, Councilmember Mary M. Cheh, Chairperson of the Committee on the Environment, Public Works, and Transportation, will hold a public hearing on B19-630, the District of Columbia Taxicab Commission Service Improvement Amendment Act of 2011, and B19-635, the Wheelchair Accessible Taxicabs Parity Amendment Act of 2011. The public hearing will begin at 11:00 AM in Room 412 of the John A. Wilson Building, 1350 Pennsylvania Avenue, N.W. The Committee invites the public to testify or to submit written testimony, which will be made a part of the official record. Anyone wishing to testify at the hearing should register online or contact Ms. Aukima Benjamin, staff assistant to the Committee on the Environment, Public Works, and Transportation, at 202-724-8062, or via e-mail at abenjamin@dccouncil.us. Representatives of organizations will be allowed a maximum of five (5) minutes for oral presentation and individuals will be allowed a maximum of three (3) minutes for oral presentation. Witnesses should bring 10 copies of their written testimony and submit a copy of their testimony electronically to abenjamin@dccouncil.us. If you are unable to testify at the hearing, written statements are encouraged and will be made a part of the official record. Copies of written statements should be submitted either to the Committee on the Environment, Public Works, and Transportation or to Ms. Nyasha Smith, Secretary to the Council, Room 5, John A. Wilson Building, 1350 Pennsylvania Avenue, N.W., Washington, D.C. 20004. The record will close at the end of the business day on February 13, 2012. Happy Dr. Martin Luther King Jr weekend!!! There are plenty of options on this 3-day weekend. You can drop it like it's hot at the club (side eye) or take this opportunity to learn or serve your community. Here's a brief list of things to do. Martin Luther King Jr Memorial - There is a wreath laying ceremony on Jan 16th from 8-8:30am. You can also enjoy the memorial on your own. Take a young person (or 2) with you if you go. Martin Luther King Jr. Holiday Parade - The parade begins 11:00 am. The route is from Friendship Public Charter School (645 Milwaukee Place SE) and ends at Leckie Elementary School (4201 Martin Luther King Jr Ave SE) in Ward 8. 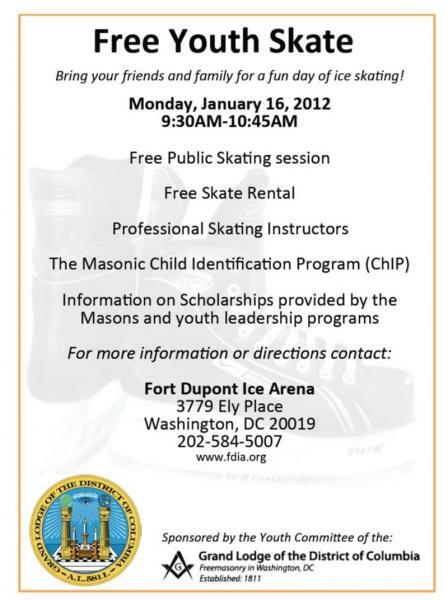 FREE Youth Skate at Fort Dupont Ice Arena - From 9:30am-10:45am bring your little humans to the arena for a FREE ice skating, including free skate rental. 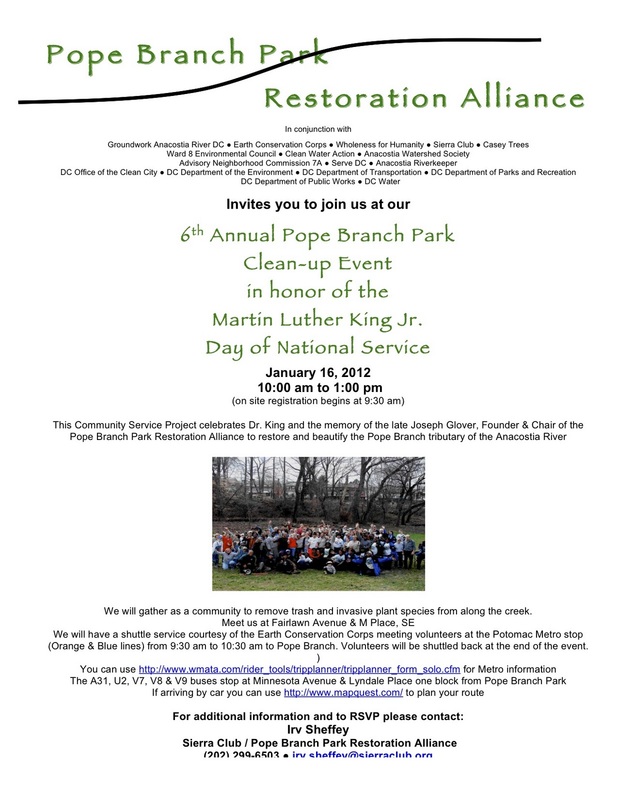 Ms V plans to help at the 6th Annual Pope Branch Clean-up, then pick up my Little Sister (from Big Brother/Big Sister Program) and take her to the MLK Memorial. Hopefully last night's hearing will be the first of many. The mood of the evening was "less talk and more do." Ms V said "get it done yesterday" in her testimony. Below is the presentation by the Deputy Mayor for Planning and Economic Development (DMPED) from last night. Here is my written testimony. In my oral testimony I added in the need for business incubators in Ward 7. Please excuse any typos. Ms V wants to make sure Ward 7 residents are informed. Below is the FY10 Unified Economic Development Report. The long and short of the report Ward 7 has seen some of the least investment by the City for economic development. 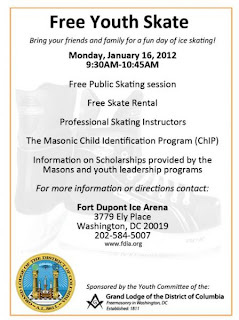 On Monday January 16, 2012, Fort Dupont Ice Arena will be hosting free ice skating classes and free youth skating. In addition to a free Youth Skate (rental skates included) from 9:30am to 10:45am, there is a free Learn to Skate Class (for youth to adult beginners) beginning at 11:00am, followed by a reasonably-priced public skate from 12:00 to 1:50pm. I love my Ward 7 neighbors. Someone emailed me these two gems this morning. Tonight is the Roundtable on Economic Development in Ward 7. Below is the witness list and presentation on development in Ward 7 from Councilmember Alexander's Leadership Council. Ms V is trying to cut back on the snark in 2012. Today's little announcement almost threw that resolution out the window. Ms. V is concerned about all things Ward 7 and DC, but there are three issues that strike a certain fire in my belly: Transportation, Economic Development, and Small Business. Usually hearings, meetings, roundtables within those three areas don't get past me. I was a little surprised that an announcement came out on Monday for a hearing on economic development in Ward 7 scheduled for Wednesday. So that's the end of my snark. *Gasp* I know you expected more and believe me I have more to say. Ms V version 2011 would have continued with at least two more paragraphs documenting the lack of adequate notice of the meeting by using newsletters, the ward 7 listservs, and tweets as exhibits. For better or for worse, your little Ms V is growing up. I'm just going to leave it at sharing the announcement with you. WEDNESDAY, JANUARY 11, 2012, 6:30 P.M.
Council Chairman Kwame R. Brown announces the scheduling of a Public Oversight Roundtable by the Committee of the Whole on Economic Development Programs/Projects in Ward 7. The public oversight roundtable is scheduled for January 11, 2012, at 6:30 p.m., Dorothy Height/Benning Library, 2925 Benning Road, NE. The purpose of the public oversight roundtable is to provide the public with an opportunity to comment on the proposed economic development programs/projects in Ward 7. Individuals and representatives of organizations who wish to testify at the public oversight roundtable are encouraged to sign up online by visiting our Council website at http://dccouncil.us. Individuals may also contact Priscilla McIver, Administrative Assistant to the Committee of the Whole, at (202) 724-8196, or via e-mail at pford@dccouncil.us and furnish their names, addresses, telephone numbers, and organizational affiliation, if any, by the close of business Monday, January 9, 2012. They should also bring 20 copies of their written testimony or submit one copy of their written testimony by Monday, January 9, 2012. Persons presenting testimony may be limited to 3 minutes in order to permit each witness an opportunity to be heard. If you are unable to testify at the roundtable, written statements are encouraged and will be made a part of the official record. Copies of written statements should be submitted to the Committee of the Whole, Council of the District of Columbia, Suite 508 of the John A. Wilson Building, 1350 Pennsylvania Avenue, N.W., Washington, D.C. 20004. January 16, 2012 is Martin Luther King Jr. Day of Service. 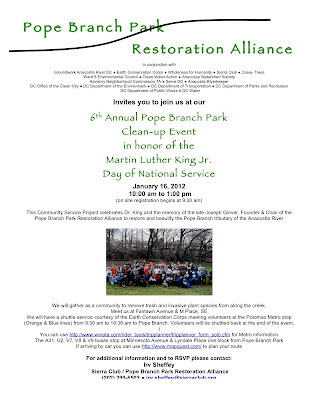 The Pope Branch Park Restoration Alliance will be doing their annual clean-up. Here are photos from last year and more here. Ms V recommends dressing in multiple layers. Froze my tushie off last year. Oh and by the way... here is a traffic advisory for bus commuters. My dear Ward 7 neighbors we need to have faith that things will get better, our quality of life will improve, and we and work together.